I’ve been experiencing some technical difficulties with my photos/camera/laptop, and I’m not quite out of the clear yet, but I think I’ve figured out how to still make things work for now, it’s just a little extra work on my part. On top of that, my kids are out of school for the next couple of months and I am trying to soak up all the extra time with them, so my posts may be a little less frequent during the Summer months. 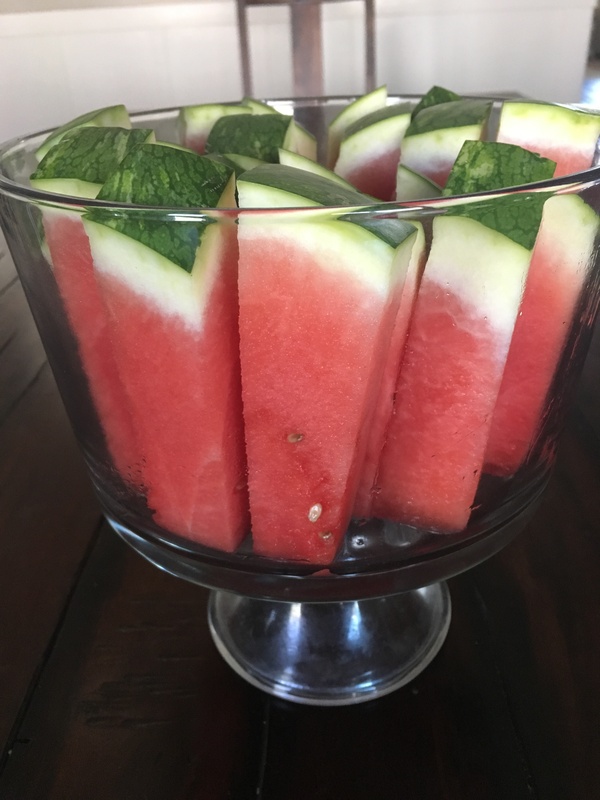 I got the idea to cut the watermelon into sticks, from my mom and I love it! Most often I cube it, removing all of the rind, and sometimes we do triangles, but this is a fun and pretty way to serve it and still be able to hold onto a bit of the rind as you eat. It’s an easy, inexpensive, fresh snack to have on the counter for kids to grab, or to bring to a BBQ to share with friends. 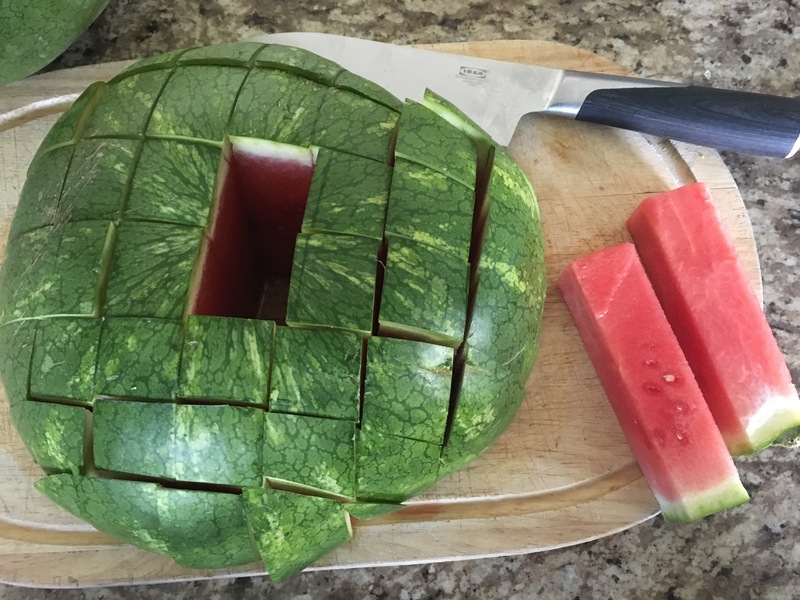 Start by slicing your watermelon in half, right down the middle of the fat part (not the long way, the shorter way). 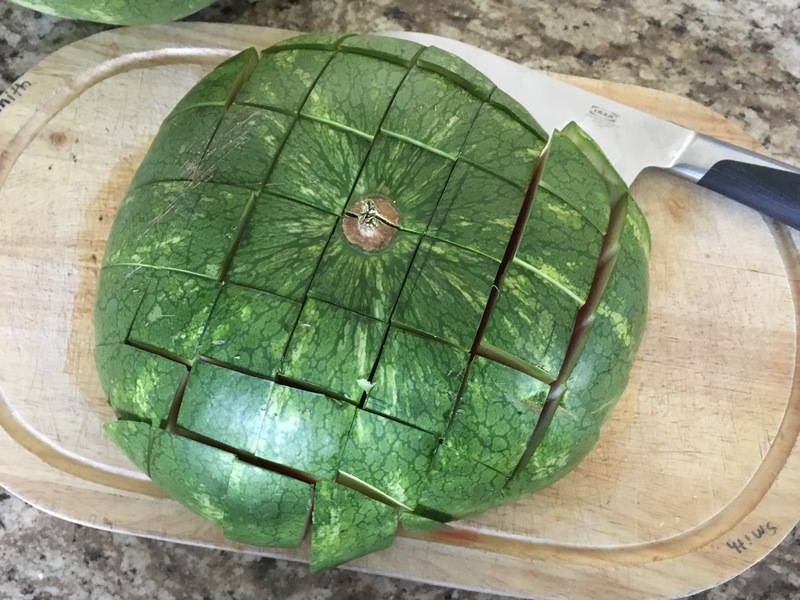 Lay the cut side down on your cutting board and then cut vertical lines about 1-2 inches apart across the entire watermelon. Then do the same thing but making horizontal cuts. The edge/corner pieces don’t have as much melon on the rind, and don’t look as pretty, so I just cut the melon off of those and we eat them right away and don’t put them on our serving dish. So pretty and fresh! Perfect for summer!